What is duality? A natural law governing the whole of creation and life as we know it. Now life itself is an ethereal substance in search of a vehicle of some kind to express its intangible and immaterial nature, and the invisible and unmanifested energy of life impregnates and forms what seems to the naked eye to be solid matter. We know that matter itself is condensed and compressed universal energy in spiritual alchemy, this energy is generally termed "primordial matter." 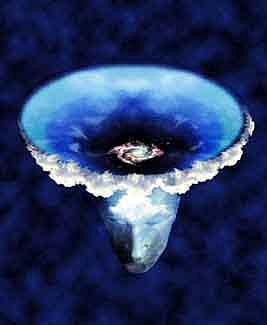 Science calls it "chaos," and sees it as a formless substance that permeates creation in its entirety. That is why primordial matter incessantly waits to be energized and transformed by its unmanifested and intangible partner the unmanifested Light of Being. Now, matter expects and anticipates to be transmuted into an infinite variety of multidimensional forms. By this ingenious method, the incomprehensible and unmanifested Source of Life manifests itself in the comprehensible and tangible substance called primordial matter, giving it an infinite and unimaginable variety of attributes and characteristics. Thus, together, the unmanifested Center of Pure Being and primordial matter impregnate all animate and inanimate manifested creations alike with their ethereal characteristic. Primordial matter fills the whole of creation, and yet, under the influence of spirit, it incessantly transforms itself into new shapes and forms. Hence, through these two completely opposite and contrary poles that govern the whole of creation, the Law of Duality comes into play, controlling the whole process of life and creation. As individuals, we personally experience the effects of the Law of Duality on a daily basis, since it is part of creation itself. However, in simpler terms, we could say that duality is based on the law of attraction and repulsion, and therefore creation itself is founded on the Law of Duality. But why is this so? First, let us clarify that the invisible complement of primordial matter is the unfathomable nature of unmanifested Being. Here is the inconceivable and extraordinary paradox that demonstrates that an unmanifested essence, an essence that does not belong to creation itself, and therefore does not exist as such for us, incomprehensible to scientific and rational minds alike, can somehow mysteriously cause of all creation. Similarly, this inconceivable essence is also the source and cause of consciousness. Why? Because without consciousness, we would not be able to understand the goal of creation, and the reason and cause for experiencing duality. Clearly, without the Law of Duality, consciousness and creation alike would have remained formless and completely unconscious. Hence, we, as conscious beings, would not be able to grasp our own mystery, let alone question our nature. Why does this Law of Duality exist at all? Simply because if we didn’t have duality, we would not yearn and strive for wholeness and unity. In other words, we would not be impelled to return to the unmanifested Source of Being. Duality, therefore, makes us conscious beings, tying and binding the concrete and abstract parts of our thought processes and intuition. It is apparent also that through duality, we can learn to harmonize our unmanifested essence with our incarnated body. 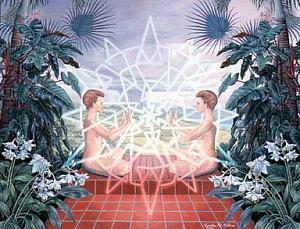 Hence, it is clear that both need each other to manifest the light of consciousness here on earth. Thus, we can conclude that, on an individual level of consciousness, our physical body is the cup that receives and manifests the unmanifested spirit, and that and through their blending and harmonization, duality dissolves into unity and wholeness. We can further say that duality governs creation and nature, since it is only through its action and workings that we are led to the unmanifested Center of Pure Being. We could compare the physical body to a sacred toolbox in which are all manner of sophisticated functional and unknown psychic processes, hidden within the duality of the body and psyche of all humanity, waiting to be awakened by Cosmic Consciousness. This implies that when consciousness is awakened in being, it has the possibility and impelling desire to ascend to higher levels of consciousness, and that these higher levels of consciousness are in themselves pathways taking incarnated beings back to their unmanifest Source? However, consciousness can be awakened only gradually, and the Law of Duality comes into play here, since consciousness is linked to eternity and infinity. Consequently, because, as human beings, we all belong to distinct and varied levels of consciousness, then there exists a parallel plane of reality, since creation is governed by the Law of Duality, and duality itself is based on the natural power of attraction between the unmanifested and the manifest. We could also add that numerous planes and levels of consciousness exist, which explains why, say, the physical body of an illuminated mystic differs from that of an athlete. One is more muscular but both are physical vehicles for spirit and soul. But, what can we say about their levels of consciousness? Of course, both carry soul and spirit, but will they both be on the same level of awareness? Will they both be conscious of the same things and understand them in the same way? Of course not, unless the athlete happens to be a mystic at heart, meaning that he has also opened his consciousness to the realm of the abstract and spiritual. Lastly, let us clarify that by the word "mystic," we mean any human being who knows how the Law of Duality can affect him or her, and still chooses to pass through its heavy portals, learning from trial and error, which in turn harmonizes the poles of duality within human nature. Consciousness, the harmonizing factor that blends the two extremes together, has, within its ethereal substance, the essential component that unfolds what is called "mystical love." Hence a mystic is a human being who unites the two extremes within him, transforming them into a rod of illumination that draws self-consciousness back to the unmanifested Center of Pure Being.